The Filmstrip gallery is part of our revolutionary Web Site Publisher Pro series of plugins for Lightroom 3.2 to Lightroom Classic CC. It can be used to generate an entire web site and is designed to create a very powerful showcase for your work. Filmstrip delivers your images one after the other in a horizontal scrolling layout. The height of the strip is scaled to the window size so that your visitors will be treated to a “wow” experience that will help to separate your work from the crowd. The display also works perfectly on devices such as the iPhone and iPad. This demonstration site is based on one of the example template that come with the plugin. We also asked photographer Rosie Armes if she would put together a small demonstration gallery. 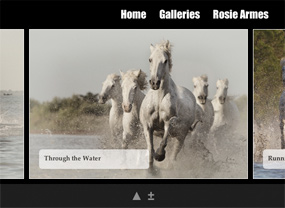 Rosie kindly agreed and created a site with four galleries in two catagories to demonstrate the hierarchical capabilities of the plugin. 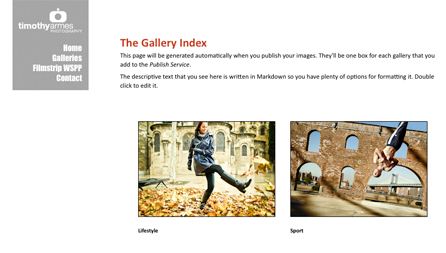 A single gallery may be spread over multiple "pages". Very configurable interface. The "filmstrip" can be displayed in many ways thanks to the ability to add spacing and borders. Optional fixed size header and footer areas give you space to put menus and controls that won't interfere with the images.